To have the 2013 Mercedes Benz G63 armored contact us below. At 187.5 inches in length and 76.3 inches in width (4.5 inches wider than the G550 thanks to its fender plumage), the G63 is certainly no sprite, but its flat-panel and right-angle design exudes a personality even bigger than its dimensions. The comparatively modern and swoopy Mercedes GL450 is longer and lower, and disappears into suburban anonymity easily. The G-wagen, on the other hand, remains perpetually in the spotlight, eliciting smiles from children and inspiring constant rubbernecking and, we assume, envy. For 2013, the G63—which rung up 60 percent of all G-wagen sales last year—gets a few subtle exterior updates: new mirrors with embedded turn signals, a bespoke twin-bar grille and front bumper, and the requisite LED daytime running lights. The interior was mildly reworked as well, with the COMAND infotainment screen placed front and center in the re-sculpted dashboard, and the console-mounted shifter getting slightly redesigned as well. The latest mbrace2 telematics system also makes an appearance. Our wagon also had the optional Designo Mystic Brown exterior paint and leather interior package ($2300), which brought our as-tested price to a not-inconsiderable $137,505. But make no mistake: The G-wagen is no suburban poseur. According to Mercedes, each one takes appropriately ten days to assemble. We recently drove one—several really, including a few not-for-the-U.S. diesel-powered units—up a side of the “Schöckl,” an Austrian mountain that more or less serves as the proving grounds for all things G-class. As impressive and effortless as the ascent was, it was the descent where the G-wagens truly demonstrated their mettle. Without warning, our guide pointed the nose downhill and simply floored the accelerator. Instantly, heads bobbed and elbows swung as we descended the mountain, literally launching off the same rocky precipices that we had so gingerly crawled over on our ascent. Grab handles were fully utilized, our respect for the G-wagen’s structure solidifying somewhere around 4000 feet above sea level. The overall effect was not unlike pushing a hand-built Bösendorfer grand piano—an equally storied and sturdy device meticulously assembled by Austrian craftsman—off a cliff, allowing it to freewheel through Ricola territory unheeded and expecting it to arrive at the base in perfect tune. We won’t speak for our theoretical piano, but our convoy of G-wagens arrived at the base in perfect pitch. Starting with that demonstrably robust platform, AMG goes to work optimizing the suspension and powertrain for performance, placing a bit more emphasis on the “on-road” side of the on/off-road compromise. Equipped with a set of 20-inch Yokohama Advan S.T. radials, the G63 pulled 0.58 g on our 300-foot skidpad, a negligible improvement over the 0.56 g we recently extracted from a mere-mortal 2013 G550. The numbers for both vehicles were stability-control inhibited, and don’t necessarily tell the whole story. Where the G550 leans in the corners like a broken barstool, the G63 handles curvy roads like, well, the best 34-year-old, body-on-frame SUV born of industrial-military design that money can buy. Steering is appropriately weighty for such a butch vehicle, and the body remains relatively flat and panic free on its live axles throughout most sensible-speed maneuvers. Provided the winds are still and the road smooth, the steering will stay unwaveringly on-center, but if you’re looking for precise, tactile feel then you’re shopping on the wrong side of the showroom. Even so, we like it better than the light and overly assisted steering in the fully modern 2013 GL63 AMG. 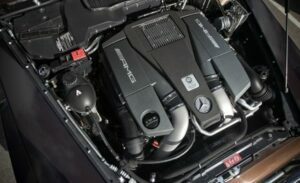 Interestingly, the more street-savvy GL63 AMG scored a comparatively lofty 0.84 g on the pad, despite weighing in only 128 pounds shy of our G63’s 5940-pound as-tested weight. What the G63 gives up in the corners, however, it more than makes up for on the straights, clobbering the quarter-mile in 13.5 seconds in our testing. No muss, no fuss, just stand on the throttle and let the music emanating from its trademark twin side-exit exhausts serenade you all the way to a 106-mph trap speed. The brave will want to keep the throttle pinned to explore the electronically limited top speed of 132 mph, an exhilarating experience sure to answer any lingering questions you may have regarding the aerodynamic properties of a shipping crate. In short, the slightest of breezes will attempt to alter your course, and actual speed is irrelevant. The real grins come simply from the audacity of the act. The prime instigator behind the acceleration is a twin-turbo, 5.5-liter V-8 engine, producing 544 horsepower and 560 lb-ft of twist. Refined yet brutal, exotic yet tractable, it’s an engine that tries to be all things to all people, and, by most standards, succeeds. Its Achilles heel is dismal fuel economy, almost comically addressed by the inclusion of a thrifty stop-start system. Regardless, fuel economy is still 12 mpg for city driving and 14 mpg on the highway. We averaged 12 mpg in mixed driving. For more information on bulletproof vehicles call 801.393.1075.